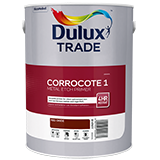 Dulux Trade Corrocote 1 Metal Etch Primer is a versatile primer for clean galvanised iron and non-ferrous metals. May be used as a pre-treatment primer for new steel surfaces, which have been sand blasted to Sa2 minimum. Provides an excellent primed surface for coating with conventional paints and some heavy-duty coatings.